I hit 10% completion on the first draft for Of Storm and Sky, so I decided to celebrate by doing a board game review. I have been trying to incentivize my writing process by setting milestones and rewarding myself when I hit them. So far, it’s keeping me motivated. Besides, it’s not like writing a board game review isn’t writing; it just isn’t on the project I’m currently involved in. I played Broom Service for the first time three years ago and received a copy as a gift two years ago. In that time, I have played with groups ranging from 3 to 5 and have found the game to be well balanced and enjoyable each time. In addition, Broom Service comes with a double-sided board and several advanced play options. Add in the random element of cloud placement, and there is a lot of replayability here. 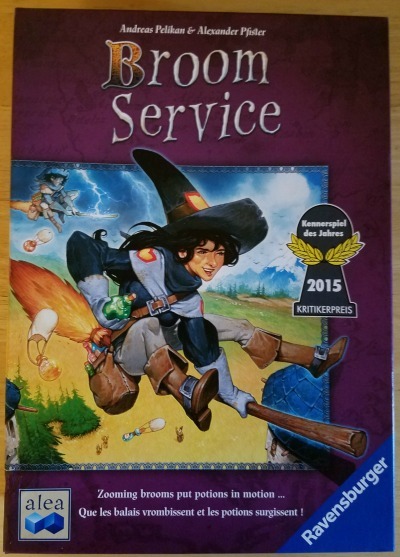 Broom Service was designed by Andreas Pelikan and Alexander Pfister and was published by Ravensburger in 2015. Between 2 and 5 people can play, but when playing less than 5, additional rules apply to help balance the game. As far as I can tell, no expansions exist for the board game, but there is a card game of the same name with expansions, and the card game Witch’s Brew (also designed by Andreas Pelikan) with similar mechanics but published by Rio Grande Games. 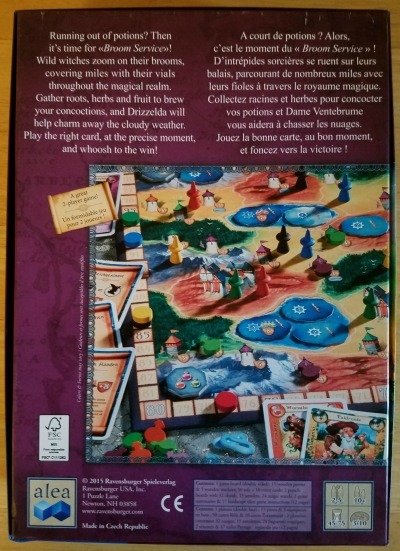 This review covers only the board game published by Ravensburger and not these other similar games. My copy of Broom Service came with bi-lingual instructions and assets. One set is in English, the other is French (although I am not 100% certain). Players have a goal of delivering potions to the various towers across the map, which earns them points. To accomplish this, they assume the role of witches, gatherers, druids, and fairies, each with their own abilities. To further complicate things, Broom Service utilizes a “Follow the Lead” mechanic, meaning that all of your strategy can go out the window in a heartbeat if the player before you plays a role before your pieces are in position to utilize it. More on that later. The back of the Broom Service box. Broom Service has elements of board control, play order management, high risk / high reward action, and resource management. In addition, when playing with less than 5 people and using the included Events (the recommended way of playing), victory points can be gained and lost each turn, almost as a separate resource. Setting up Broom Service is easy. 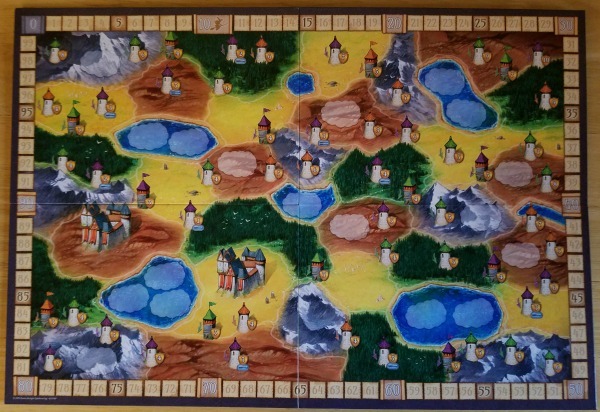 Select the side of the board to be played (keep in mind the advanced side of the board requires the use of the mountain tiles, hill tiles, and forest tiles, while the basic side allows players to only allows the mountain tiles and amulets to be used (it is optional); both sides support the use of the advanced storm clouds (again, optional)), and sort out the resources. Randomize the storm clouds and place them on the board inside their outlines. If you are playing on the advanced side of the board, randomize the hill, mountain, and forest tiles and place them face up on the board. If desired, the mountain tiles can be randomized on the basic side of the board, but they will replace several of the highest scoring towers on that side. If the amulets are to be used, one of each color should be placed in the mountain zones with the tile outlines. 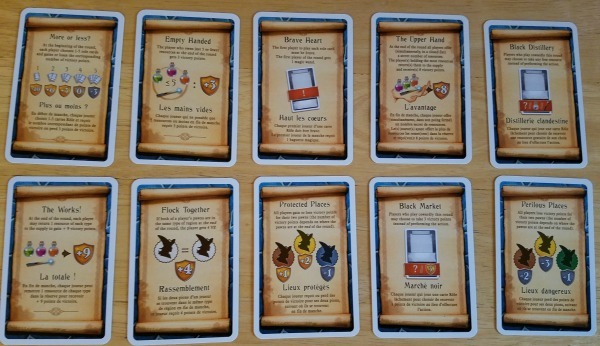 The game uses cardboard tokens for the storm clouds and wands, and wooden pieces for the potions, pawns, and scoring tokens. 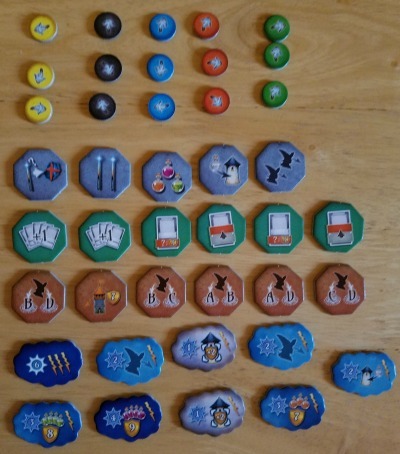 Each player places one of their pawns on each starting castle and their scoring token at 10 on the point track. Also, each player should take the ten role cards with same color backing as their pawns. These cards include four witches (prairie, hill, forest, and mountain); two druids (peak and valley); three gatherers (root, herb, and fruit); and one weather fairy. All players have access to the same 10 role cards. Each one serves a special function and players only get to select 4 per round to perform. Lastly, if you are playing with them, randomize the ten Event cards and draw the first one. When playing with fewer than 5 people, randomize the 10 role cards of an unused color and draw one (for four players), two (for three players), or three (for two players). The roles drawn from the unused color’s deck will cost any player 3 points to use them that round. Broom Service is played out over 7 rounds. All players then simultaneously and secretly select four roles they wish to play that round (out of the 10 card deck each player has). Each role has a “brave” action and a “cowardly” action that are very similar. For example, the Prairie Witch’s “cowardly” power allows the player to move to a prairie zone, whereas the “brave” action allows them to move to a prairie and place a potion (which grants points) as if they had also played the Valley Druid card that turn as well. In all cases, the “brave” power is much better than the “cowardly” power. There is a downside, though. The basic board has more towers than the advanced board. Because “cowardly” actions take place immediately, these actions are uninterruptable–the player makes a no risk / low reward action. When making a “brave” action, the player cannot complete the action immediately. 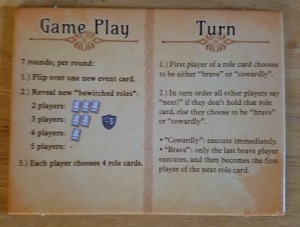 Instead, they wait to see if any of the subsequent players with the same role card selected in their four card hand would like to be “brave.” If another player decides they will be “brave,” the first player takes no action and then the new “brave” player waits to see if a subsequent player will be “brave.” Only the final player with that role card that chooses to be “brave” can complete the action. They then become the first player to pick the next role at the completion of that turn. Players may also elect to be “cowardly” after a previous player has stated they will be “brave” to affect the play order in subsequent turns. The oldest player starts the first round. Subsequent rounds are started by the most recent player who was “brave.” The starting player then selects one of his roles and makes the decision of whether he will be “brave” or “cowardly,” and this is where the “Follow the Leader” aspect comes into play. See, once the role is selected, all players, if that role is one of the four they have selected for the round, must play that role. That means, at any time, your entire strategy for the round may go out the window because another player decides a role before you’re in position to take advantage. That Weather Fairy you wanted to use after you moved into the prairie? Too bad, you have to use it now. The good news is, you can still elect to be “brave” or “cowardly” at that time, even if you can’t complete an action with the card, simply to affect the play order for the next turn. Potions can only be placed on a tower with the corresponding potion color (green potions on green towers, orange on orange, or purple on purple) and only if the appropriate role card is played (for example, a “brave” Mountain Witch or any type of Peak Druid can place a potion in a mountain zone). Potions placed on round towers (with the arrow pointing toward the base of the tower) are permanently placed on the board; no other player can deliver a potion there and gain those points. Potions delivered to square towers (with the arrow pointing away from the base) are placed into the resource supply. These towers typically have lower point values and players can deliver to them an infinite number of times throughout the game. Points are tallied immediately, because it would be impossible to determine who delivered which potion to which tower later in the game. To determine if the tower is in a zone and is a viable delivery option, look where the base of the tower is. Some towers can be delivered to from multiple zones because they straddle the line. Players cannot move into zones with storm clouds in them. Only after the storm cloud or clouds are cleared from a zone can players move into that zone. Storm clouds are cleared by playing the Weather Fairy in an adjacent zone (note this is the only action that can affect adjacent zones) and only if the player has the appropriate number of wands in their resource pile. The number of wands required to remove the storm cloud is the number inside the radiating circle on the token, not the number of lightning bolts on the card. These count as points at the end of the game and the player aid can show how the points increase depending on the number of lightning bolts collected. And those are the basic rules. Turns proceed in a round until every player has used all four role cards they selected. 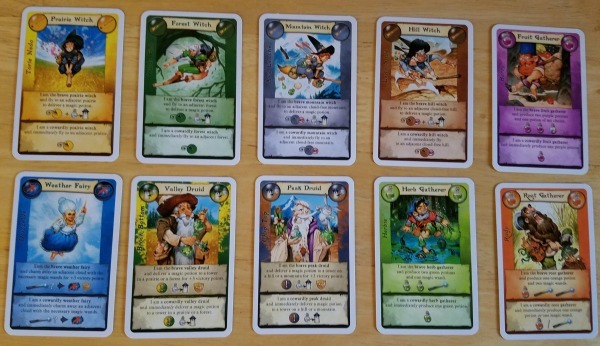 Because each player will end up in different areas of the board, sometimes a single player will play three of their four cards before another player will have to jump in and “Follow the Leader.” Only after every player has exhausted the four role cards they selected does the round end and the next one begin. Events – The basic game rules include the use of Events, which are ten cards that are revealed at the beginning of each round and affect the game for that round only, but I recommend playing a beginner game without them. Until the players are familiar with the “Follow the Leader” mechanic and have learned to balance the risk and reward of “brave” actions, the Events can be a distraction; especially since many of them penalize players with the loss of points for being in the wrong place at the end of the round. Each Event is unique and requires the players to adjust their overall strategy for the game. For example, the Perilous Places event penalizes players that end a turn in any zone except mountainous ones, costing them points at the end of the round. While the Event cards are not truly advanced, save these for the second game if playing with beginners. There are 10 unique event cards and only 7 rounds in a game. Not every event will show up every game. Fewer than 5 Players – The basic game rules include provisions for when fewer than 5 players are in the game. Although this is a basic rule, I am organizing it as advanced, because I believe a group playing this for the first time should ignore this requirement even if they have fewer than a full complement. In games with fewer than 5, players will use the 10 role cards of an unused color, shuffle them, and draw one, two, or three role cards to be “bewitched.” The number of roles drawn is dependent on the number of players: three cards drawn for a two player game; two for a three player game; and one for a four player game. These “bewitched” cards are drawn at the start of the round so players know which roles will cost them points to play before finalizing their 4 card hand. While the “bewitched” roles are still available for players to select, their use will cost the player 3 points, so they should be selected by the players with care. As with the Event cards, advanced players could likely play their first game with the “bewitched” cards, but beginners should avoid them for a game or two to learn the basic mechanics first. The included player aid outlines how to utilize the “bewitched” roles each round. Amulets – One variation to Broom Service is to play with the amulets. One amulet token of each color is placed in the mountain zones that have the mountain tile outlines. On the first turn that a player moves their pawn into one of these zones, they collect the amulet corresponding to their color. To gather all three amulets, the player needs to visit each mountain zone containing their amulets once. There are no other rules that apply, other than the scoring. Broom Service comes with a number of tiles for use on the advanced board as well as more complex storm clouds to provide variation. With the exception of the amulets, the tiles are always randomized at the start of the game. Mountain Tiles – Mountain tiles replace specific towers on the basic board and are required to play on the advanced board. These tiles should be randomized and three are drawn and placed in their respective zones. Players should refer to the rules for tile specifics, but the mountain tiles, in general, allow players to gather resources, move their pawns, and remove storm clouds as if they played the “cowardly” Weather Fairy. 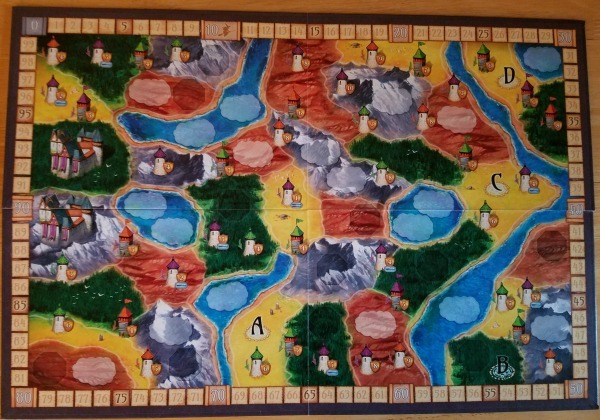 The advanced board is on the back of the basic board and is identified as the side with the tile outlines in the forest and hill zones. Forest Tiles – Forest tiles cannot be used on the basic board and are required to play on the advanced board. Randomize these tiles and place them in the corresponding forest zones. Refer to the rules for specifics, but in general, the first player into a forest zone with a tile collects that tile for later use. Once the player uses the tile and performs the corresponding action, those tiles are discarded and cannot be used again. Hill Tiles – Hill tiles cannot be used on the basic board and are required to play on the advanced board. As with the other tiles, these should be randomized and placed in the corresponding hill zones. In general, the hill tiles are focused on allowing players to move their pawns to other hill zones whenever they move into that zone. Whether the player was “cowardly” or “brave” is irrelevant; the action is completed as played, just in the new zone the pawn has been transported to. At the end of the seventh round, the lightning bolts are scored, as are any remaining resources in the player’s cache. Players will score the number of lightning bolts they have collected throughout the game in a set: one bolt = one point; two bolts = three points; three bolts = six points, etc. If you’re playing with the amulets (one of the advanced rules), amulets are scored based on the number you collect, with all three amulets yielding the largest number of points. 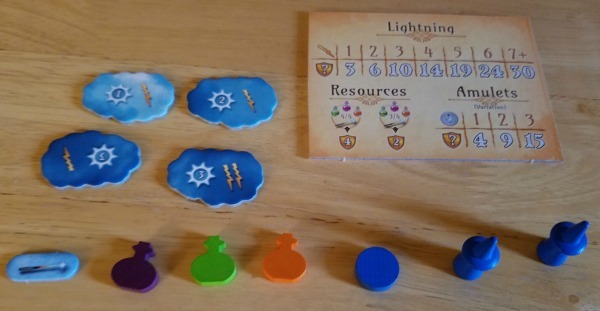 All points from resources, amulets, and lightning bolts are then summed with the player’s score on the point track around the outside border of the board. The winner is the player with the most points. The “Follow the Leader” mechanic is by far the most important factor in a game of Broom Service. Throw in the ability to override a “brave” action and deny another player an entire action, and each round’s strategy usually goes out the window on the first turn of the round. While I find this mechanic to be liberating–I don’t spend more than 30 seconds devising a strategy for the round because I know it won’t last anyway–many players can find this game to cause crippling indecision. Also, as this mechanic encourages you to throw your opponents under the “brave” bus whenever possible and deny their action, you have to approach each round with a flexible strategy. The risk / reward evaluation factors in pretty heavily as well. I typically do not play “brave” unless I can guarantee I will not be overruled (if I am the last player with cards that round) or I do not feel that my overall position would be compromised by losing an action. In my opinion, the first player of a round should never lead “brave” unless they’re playing a “gimme” role in the hope that another player will be “brave” and take the starting position from them, setting them into a better play position for later in the round. Likewise, there are many times a player can and should be “brave” and take the lead on the next turn; however, it can be hard to see when being “brave” may not help you. For example, you have an opportunity to be a “brave” Mountain Witch and move into a zone with one tower remaining; no other players are in or around the zone. It can be tempting to be “brave” and take extra placement action, but your last role card is the Peak Druid, which lets you place a potion. You may be better served to let the original player be “brave,” take your move action, then play “brave” Peak Druid to deliver the potion (that you were guaranteed to get anyway) and gain an additional 3 points for doing so as the “brave” action. The only way to directly impact your opponents’ board presence in Broom Service is to deliver a potion to a tower they were targeting before they can get to it. Since very few of the towers allow for multiple potion deliveries, players vie for control of the board by placing potions. Indirectly, players interact through the overriding “brave” action mechanic. Bold players that take many “brave” actions can find themselves with nothing to do for a round if they’re not careful, but timely “brave” actions can turn the tide of a game. Additionally, I can see at least two different patterns of thought when playing with the Event and “bewitched” card rules. A player can ignore the point swing altogether and stay the course. This means those players may have more opportunities to be “brave,” as the Events and “bewitched” roles will influence the other players; however, if more than one player is utilizing this strategy, they can undermine each other quickly, setting them far behind the rest of the group. The other clear strategy is to strictly adhere to the Events and “bewitched” cards, adjusting your strategy each round to best account for and maximize (or minimize) their points. That player may need to sacrifice delivering potions to high scoring towers to avoid any unnecessary losses on the score track. A 7-point tower looks juicy until you realize it may cost you 5 points to deliver there, after all. Broom Service is fun and flexible with lots of replayability. I especially enjoy the way the “Follow the Leader” and “brave” action mechanics interact with each other, but I foresee players who suffer from indecision might have trouble with the game. Additionally, highly competitive players that don’t react well to having their entire turn thrown out of order by another player leading with a role card they aren’t prepared to play may want to avoid the frustration here. For those that enjoy friendly competition, and those that can give as well as they get, Broom Service may be worth checking out. As of the writing of this post, Broom Service is $28 on Amazon (normally $45) and, at that price, well worth adding to your collection if you enjoy board games and have a group that feels the same.